Provided that the previous permission of the officers of the Education Department shall not be required for the opening of new elementary schools by the district boards in places which have no school within a radius of one mile and which have a population of not less than 500. In such cases it will be sufficient if the District Educational Officer is informed of the opening of the schools as soon as possible. 4. (a) No new schools shall be permitted to be opened by a local authority in a locality which is adequately served by an aided school or schools already existing in the locality. (b) No new school shall be permitted to be opened by a private management in a locality which is adequately served by schools already existing in the locality. (c) No new class shall be opened in an existing school without previously obtaining the permission of the departmental officers. The Officer empowered to grant such permission shall be the District Educational Officer. 5. (a) Applications for recognition of schools or of additional standards (Appendix 2) shall be made to the District Educational Officers through the Deputy Inspector of Schools. An appeal shall lie against all orders of the District Educational Officer to the Divisional Inspectors. (b) Recognition shall be granted from the date of the opening of the school or of the additional class, or from the date of the application, if the application is made more than three months after the date of the opening of the school or of the additional class. (c) Recognitions shall not ordinarily be granted to a school or a class opened by a local authority or by a private management in contravention of rules (1) and (4)(c). (d) Recognition shall not be granted to any school situated, in a building which is inaccessible to the members of any caste or community. 6. Applications from Managers of schools for the continuance of temporary recognition (Appendix 2) of their schools or of standards of their schools shall be made to the District Educational Officer through the Deputy Inspector concerned not later than three months before the expiry of the period of recognition. 7. The District Educational Officer may, for any satisfactory reason on the recommendation of the Deputy Inspector entertain an application for recognition from the date of opening of the school, or of the additional class in any case where the application has been made more than three months after the date of the opening of the school or of the class. In all cases where the period to be condoned exceeds three months, the approval of the Divisional Inspector of Schools shall be obtained. 8. Every lower elementary school shall ordinarily have at least five standards, except schools approved by the Divisional Inspector of Schools as feeder schools with standard I and II or standards I, II and III. 9. Application for any change in the management of an elementary school shall be made to the District Educational Officer. 10. Pre-basic sections attached to Basic Schools and each standard above the fifth shall be separately recognised. 11. Recognition shall depend upon satisfactory evidence of the educational needs of the locality as well as of the other matters specified below. (2) In elementary schools with standards above Standard V, the headmaster or headmistress and the teachers in charge of Standards VI to VIII, should ordinarily hold trained teacher's certificates of the secondary grade. Provided that the Pandit is assigned all the language work of the higher elementary standards and where necessary one or more of the lower standards also and that the secondary grade teacher if any, of the lower standard concerned, is given some work in the higher elementary standards. Provided also that in every elementary school with Standard V as the highest which does not have a trained teacher of the secondary grade on its staff, there shall be employed at least one trained teacher of the secondary grade on and from the 1st June 1960. (4) (a) Schools employing untrained teacher may not ordinarily employ more than one untrained teacher for every two trained teachers without the specific approval of the District Educational Officer. Explanation. - The following persons shall be deemed to be trained teachers for the purpose of this rule. (b) all untrained teachers employed in elementary schools who have not attained the age of 35 shall be sent for training at the earliest opportunity. (5) The District Educational Officer may exempt any named headmaster or headmistress of or teacher in an elementary school under private management or any named headmaster or headmistress of an elementary school under a local authority from the possession of any qualification prescribed for such headmaster or teacher by sub-rule (2) or (3). 12A. Trained teachers of the higher elementary grade who have passed the Matriculation or who holds, completed Secondary School-Leaving Certificates qualifying them for admission to University course of studies or to the examination conducted by the Tamil Nadu Public Service Commission for selection of eligible candidates for clerical posts and who hold certificates issued by the Headmasters of Basic Training Schools of having satisfactorily undergone training in Basic Training Schools for a period not less than three or five months as the case may be, shall be considered as Secondary grade trained teachers so long as they are employed in Basic schools. Provided that in exceptional cases the Divisional Inspector may exempt any named manager from any or all of the conditions mentioned above for any period which may extend up to one year. The Director has been authorised to grant exemption beyond 31st March 1952-vide Government Memo. No. 28847 c/52-1, Education, dated 25th August 1952. 13. (1) (i) Every teacher working in a school under private management, except schools under the Railway management, shall possess a teachers' service register issued by the District Educational Officer. It shall be the duty of the manager to specify clearly in the service register, the terms of service under which the teacher is recruited stating whether he is appointed on probation or temporarily (if so, for what period) or permanently and his salary and scale of pay, if any. It shall further be the duty of the manager to get the service register counter-signed by the Deputy Inspector concerned. (ii) No qualified teacher shall be appointed in a permanent vacancy on a temporary basis or for a stipulated period. All appointments in permanent vacancies shall be made only on probation for a period of one year, but the management may before the expiry of that period extend it to a further period of not exceeding 12 months for reason to be approved by the Deputy Inspector of Schools. In the absence of any such extension, the teacher shall be deemed to have completed his probation satisfactorily and be confirmed or deemed permanent from the date of completion of probation. A teacher whose probation is extended shall be deemed to have satisfactorily completed his probation at the end of such extended period unless his service is terminated after following the procedure laid down in sub-rule (2) before the last day of the period of probation and he shall be confirmed or deemed permanent from the date of completion of probation. (iii) In case of aided elementary schools which are granted permanent recognition, the number of teachers employed at that time shall represent the number of permanent posts and any vacancy which arises in permanent posts shall be considered as a permanent, vacancy for the; purpose of clause (ii) above. If schools with temporary recognition consisting of Standards I to V or I to VII or VI to VIII or I to III recognised as feeder schools are allowed to continue beyond one year, the teachers employed in them may be considered as probationers from the date of their appointment in the school. (iv) Appointment in vacancies arising out of bifurcation of standards of elementary schools shall be made on a temporary basis and a teacher appointed in such a vacancy shall be continued in service so long as there is need for a continuance of sections unless his services are terminated after following the procedure laid down in sub-rule (2). However, if a teacher appointed in such a vacancy is continued in service for three years, he shall be confirmed or deemed permanent from the date of completion of three years of service. (2) Appointments in leave vacancies shall be made on temporary basis. (i) No teacher whose appointment is not covered by clause III below shall, except with the permission of the management, be entitled to leave the school without giving three months' notice or payment of three months' salary in lieu thereof to the management. (ii) The management of a school shall have power to terminate the services of any member of the staff whether permanent, temporary or probationary only as provided hereunder. (a) Without notice for any or all of the following reasons, viz., suspension or cancellation of teacher's certificate by the Director of Public Instruction or suspension by the Divisional Inspector under rule 154 of the Tamil Nadu Educational Rules, or when action is taken against the teacher by the Director of Public Instruction under rule 14 below. Provided that in all cases coming under (b), before the issue of notice, the teacher shall be informed in writing of the charges against him and shall be given a reasonable opportunity for stating his case in writing or in person, and the statement made by the teacher if any, shall be taken, into consideration before a final decision is taken by the management. Provided further that before the issue of the notice the Deputy Inspector of Schools should be consulted and his approval obtained by the Management about the propriety of such an action, the Deputy Inspector being furnished with all documents relating to the case to facilitate him to offer his advice. When on a teacher's appeal, the District Educational Officer orders reinstatement, the management shall forthwith reinstate him within 10 days of receipt of the orders, notwithstanding a further appeal submitted or proposed to be submitted by the management to the Divisional Inspector and shall inform in writing the Deputy Inspector of Schools and the District Educational Officer of the fact of having done so. Failure to comply with such orders of the District Educational Officer may entail action against the management under rule 14 below. If the termination of the services of a teacher under this rule is held unjustified on appeal by the teacher, the management shall take back the teacher, treating the period of his absence as on duty without any claim for Government grant for the period of such absence. If the teacher, having sought employment subsequent to the termination of his services, claims only compensation for the loss due to unemployment, the management shall be liable to pay the teacher full salary and allowances for the period of his unemployment, which shall be limited to the maximum period of three months. (iii) No notice on either side or prior consultation of Deputy Inspector of Schools as required under the proviso to clause (ii)(b) above is necessary in the case of teachers who are appointed purely on a temporary measure for three months or less or when teachers are discharged after the expiry of the specified period stipulated in the Teacher's Service Register. In case the vacancies last longer than the stipulated period the usual procedure shall be followed. (iv) No teacher who is a permanent member of a school shall, when he has not been given notice of termination of his services or when he has not been given notice by the management for relieving him of his services, apply for an appointment under any other management except through the management of the school in which he serves. The penalty for breach of this rule shall be dismissal of the teacher from the service. The management shall not refuse to forward such application when the need arises, unless he gives due notice or pays an amount equal to the salary for three months or for such periods by which the period of notice falls short. (v) It shall be lawful for a management if satisfied on medical evidence that a teacher is unfit and is likely for a considerable period to continue to be unfit by reason of ill-health to discharge him from service on paying him three month's salary less any amount which may have been paid to him as leave allowance after the date of his last appearance in the school for the regular discharge of his duties as teacher subject to a minimum of one month's full salary. The management of a school may suspend any permanent, officiating or temporary member of the staff, pending framing of charges, against him for a period not exceeding three months for gross insubordination, serious misconduct, criminal prosecution, mental unfitness or any other cause, if such a course is required urgently in the interest of the institution. In all such cases, a report of having kept the teacher under suspension shall be sent to the Deputy Inspector on the same day by registered post. In the case of teachers who have been suspended for criminal prosecution and against whom criminal cases are pending the management may, with the prior approval of the District Educational Officer place the teacher under suspension for a further period beyond three months until the cases are disposed of. When the suspension of the teacher is held to be unjustified by the District Educational Officer the management shall pay full pay and allowances to which the teacher would have been eligible had he not been suspended. The period of absence will be treated as period spent on duty. (vi) The management and the teachers have right of appeal against orders arising from these rules and the appeal shall be disposed of by the District Educational Officer. A second appeal shall lie with the Divisional Inspector of Schools. An appeal shall be valid only if it is made within a period of two months from the date of the orders against which the same is preferred. (vii) If the termination of service of a teacher is necessitated on account of the fall in strength and attendance, the services of the junior most teacher in service shall be terminated after the requirements of rule 12(2) and (3) regarding the appointment of Secondary Grade teachers are complied with. If the junior most teacher happens to be a trained teacher and if there are untrained teachers also on the staff of the school, the services of the junior most untrained teacher shall be terminated retaining the trained teacher even though the latter may be junior-most. If there are no untrained teachers on the staff, the services of the junior most teacher shall be terminated. The provisions of sub-clause (b) of clause (ii) shall apply to every termination of service under the clause. (viii) The provisions of rule 13(2)(ii)(b) shall not apply in the case of new appointment made temporarily in vacancies caused as result of action under rule 14 below or 154 of the Tamil Nadu Educational Rules, if his services are to be terminated consequent on the return of the permanent teacher on the expiry of the term of the punishment imposed on him under the said rules. The teacher whose certificate was suspended as a temporary measure under rule 154 of the Tamil Nadu Educational Rules, or who was declared unfit to hold the post for a temporary period under rule 14 below as the case may be, will have a right to claim reinstatement in service in the school in which he was working prior to his relief on the expiry of the term of his punishment, provided he was a permanent incumbent. The management shall reinstate him in the post which he held before relief. (3) No deduction of any kind shall be made from the pay of a teacher except by way of deductions in respect of a Provident Fund and fines imposed for disciplinary purposes. A record of such fines shall be maintained in the form prescribed in Appendix 13. 13A. Fines imposed on teachers by managements of aided elementary schools with reference to the preceding rule 13(3) shall not exceed a sum of Rs. 5 on any single occasion. In cases where the fine levied on a single occasion exceeds one rupee, or where the sum total of fines imposed on a teacher within a period of one month exceeds three rupees, an appeal shall lie to the District Educational Officer. 14. The Director of Public Instruction may, after due enquiry declare a teacher to be unfit for employment in a recognised school. He may likewise declare a person to be the manager or correspondent of a recognised school. 14A. The Director of Public Instruction may refuse recognition to or withdraw recognition from a school in which he is employed as a teacher whom he has declared unfit to be a teacher, or a teacher whose certificate has been cancelled or suspended under rule 154 of Tamil Nadu Educational Rules or whose Service Register has been withdrawn by the Divisional Inspector. The Director of Public Instruction may also refuse or withdraw recognition if the school is under the management of a person who has been declared by him to be unfit to be a manager or correspondent of a recognised school. 15. No teacher whose certificate has been cancelled or suspended under the Tamil Nadu Educational Rule 154, or whom the Director of Public Instruction, after due enquiry, declares to be unfit to be a teacher, or whose service register has been withdrawn by the Divisional Inspector shall, while such cancellation, suspension, declaration, or withdrawal, is in force, be employed in a recognized school; nor shall any grant be assessed on behalf of any such teacher. Provided that when the number of pupils in average attendance in any one standard or section of a standard exceeds 35, it shall be divided into two sections if the Deputy Inspector of Schools so directs. 17. The present of pupils unprotected from small-pox may be regarded as a sufficient cause for withdrawal of recognition. 18. The building used for the school shall be suitable, shall admit sufficient light and air and shall be kept clean. 18A. When a school building is required for purposes of election conducted either by the Government or by a local body, the day on which the elections are to be conducted shall be treated as a holiday and the school shall be closed on that day. In such cases the requisition requiring the school building should be sent to the headmaster or headmistress, as the case may be, by the Returning Officer at least one clear week prior to the date of elections and shall be made available only when it is available. The headmaster or headmistress shall report the fact to the Inspecting Officer concerned immediately on receipt of the requisition from the Returning Officer. Any deficiency in the minimum attendance prescribed for elementary schools on account of their closure under this rule shall be condoned by the District Educational Officer. 19. The provisions of much furniture need not be insisted upon but there should be a supply of suitable pictures and other simple appliances. Provided that where list of text books used in the schools under the management of a local body have been sent to the educational authorities such local body may, if it applies for the recognition of new school under its management forward along with the application for recognition a certificate in Form A or Form B below, as the case may require and such certificate shall be deemed to be sufficient for the purposes of this sub-rule. There has been no change/have been no change in the text books since the transmission on the list, dated.........except to the extent specified below. The change has been made/changes have been made with the approval of the District Educational Officer. Book since substituted or additionally brought into use and the year of its introduction. Number and date of the proceedings of the District Educational Officer approving the book. (c) Text books shall not be changed within three years of their introduction except with the previous approval of the District Educational Officer and for valid reasons. (d) No library books other than those included in the list of books approved by the Text Books Committee for the purpose shall be purchased or otherwise obtained for the school without obtaining the permission of the District Educational Officer concerned. The registers must be carefully kept by the headmaster and headmistress and should be countersigned by every Inspecting Officer who visits the school. No entry should be made in the inspection register except by an Inspecting Officer. The entries should be in a language understood by the headmaster. In the Visitors' book district officials and other visitors to the school may be invited to make remarks. 22. (a) Admissions shall ordinarily be made only twice a year, once at the commencement of the school-year and again after the Christmas, Pongal or Mid-term holidays. The admission shall be made within a month from the commencement of the school year or from the date of reopening of the school as the case may be. No pupil may be admitted at any other time unless the sanction of the Deputy Inspector is obtained for such admission. (i) No pupil shall be newly admitted except on an application made in the form in Appendix 2 in part I of the rules relating to Elementary Schools which must be signed by his/her parent or guardian. All such applications shall be filed separately in the record of the school. (b) When joining another school, a pupil shall be asked to produce the record sheet obtained by him from the school previously attended by him. When a pupil seek admission for the first time into a school not having studied in any school previously, he shall be placed in the standard of class which the headmaster, or headmistress considers suitable. When a pupil leaves one school and joins another, the headmaster or headmistress of the latter school shall ordinarily place him in the standard or class to which the transfer certificate, or record-sheet declares him fit. In case where the pupil has been placed in a class or standard higher or lower than that for which his transfer certificate or record sheet declares him fit, the headmaster or headmistress shall preserve a record of any test he may have made of the pupil's attainment and immediately report such case to the Inspecting Officer. The Inspecting Officer may order the removal of any pupil from one standard to another if it seems desirable. A record sheet shall be maintained for each pupil in the school by the headmaster or headmistress in the form prescribed in the Appendix 3 to the rules framed under the Madras Elementary Education Act, 1920. (c) If a pupil is found to have obtained admission by means of a false record sheet or false representation of any kind he shall summarily be dismissed by the Deputy Inspector of Schools with forfeiture of whatever fees he may have paid. (d) In the event of the pupil having been dismissed under the above mentioned sub-rule the Deputy Inspector of Schools shall record his reasons for the dismissal and report the fact within three days of such dismissal to the parent or guardian of the pupil and to the District Educational Officer, by registered post. A pupil thus dismissed from one school shall not be admitted into any other recognised school within a period to be determined by the District Educational Officer on the recommendations of the Deputy Inspector of Schools concerned. A pupil who seeks admission, into a recognised school by means of false record sheet or false representation but who does not actually obtain admission may be debarred from being admitted into any school for a period not exceeding one, year to be determined by the District Educational Officer, on the report of the Deputy Inspector of Schools concerned. 24. Instruction must be given through the medium of the language of the pupils wherever this is possible. The exceptions would be cases of Muslims or pupils with a language different from that of the bulk of the pupils. 25. The course of studies shall be based on the syllabus issued by the Director with the approval of the Government. A copy of the time table shall be forwarded to the Deputy Inspector as soon as the school year commences. Scheme of studies from which selections should be made will be issued from time to time. Due regard should be paid to local circumstances especially in rural schools where school hours and vacations should be suited to agricultural conditions. The Inspecting Officer should record his opinion in the inspection book as to which subjects each teacher is qualified to teach and no other subject should be attempted by him. Special care should be taken in this respect in regard to English. 26. Recognition may be withdrawn from any school, whether under public or private management, which refuses admission to any pupil merely on the ground of the caste or community to which he belongs. If no pupils belonging to the scheduled classes are actually attending school, it will be deemed to refuse admission to such pupils within the meaning of this rule, unless the management of the school shows that no such pupils are residing within a distance of one mile from the school or adduce other satisfactory reasons for the absence of such pupils from the school. Before recognition is withdrawn from any school, the District Educational Officer shall give the management of the school at least one month's notice of his intention to do so. 27. In the case of schools under private management failure to comply with rules issued by Government for the institution of a provident fund for teachers in non-pensionable service shall be considered as sufficient cause for withdrawal of recognition. 28. Recognition may be withdrawn from any school, if it is reported by the Inspecting Officers, that the salary of any- teacher in the school is not being paid to him in accordance with the terms set forth in his service register, or that any of the instructions in the service register has been violated by the management. 28A. Recognition may be withdrawn if any of the conditions of recognition are violated. 28B. Recognition may also be withdrawn from school functioning in a locality where the system of basic education has been introduced, if the Director of Public Instruction considers that the school in question shall not be allowed to continue as an ordinary elementary school. 29. Recognition may also be withdrawn from schools, if the managements fail, without adequate cause, to depute their teachers for retraining in basic education at the centres organised by the department of Public Instruction. 29A. No fees shall be levied from pupils the annual income of whose parents or guardians does not exceed Rs. 1,200 a year, subject to the production of certificate in the form prescribed in Appendix 26. 29B. No fees shall be levied from pupils belonging to the Scheduled Castes specified in Group I of Appendix 17-A of the Tamil Nadu Educational Rules irrespective of the income limits of their parents and they shall be allowed to retain the concession for a second year also in any one of the Standards from I to VIII. 29C. No fees shall be levied from the children of non-gazetted employees of the State Government. Employees of the local, bodies whose pay does not exceed Rs. 300, a month, and of teacher, employed in aided elementary and secondary schools subject to the production of a certificate of income by the parent or guardian in the form prescribed in Appendix 26. Provided that such concession shall be withheld from a pupil in any of standards I to VIII in elementary schools only if he or she is detained in the same standard more than once. 30. Corporal punishment shall not be inflicted on pupils in elementary schools. The term "manager" as used in these rules includes also his accredited representative. For each teacher of the Grade if employed in non-basic schools. For a pandit appointed under rule 12(2) of the Rules for recognition and possessing the qualifications prescribed in Rule 13M.E.R. (c) Who has passed the Nursery, Montessory or Kindergarten Training School-Leaving Certificate Examination of the Elementary or Secondary grade, as the case may be, under the revised scheme for the respective kind of training, teachers with elementary certificates being treated as equivalent to Higher Elementary Trained teachers. (d) Trained teachers of the Higher elementary grade who have passed the Matriculation examination or who hold completed Secondary School-Leaving Certificate qualifying them for admission to University course of studies or to the examination conducted by the Tamil Nadu Public Service Commission for selection of eligible candidates for clerical posts and who hold certificates issued by the headmasters of Basic Training Schools of having Satisfactorily undergone training in Basic Training Schools for a period of not less than three or five months as the case may be, shall be considered as secondary trained teachers so long as they are employed in Basic Schools. (v) an "untrained teacher of the collegiate grade" means untrained teacher who has passed the B.A., or the B.Sc., degree of the Madras, Andhra or Annamalai University or any other degree which qualifies him for admission to a training institution of the Collegiate grade. 3. If any question arises as to whether a teacher is a trained or untrained teacher of a particular grade for the purpose of rules 1 and 2 the question shall be referred to the Director of Public Instruction Madras, and his decision thereon shall be final. 4. Assessment of grant. - (1) No grant shall be calculated in a month for any teacher in a school if the average total attendance for the month is less than twenty pupils. (2) Grant shall be allowed at the rate of one teacher for every twenty pupils in monthly average attendance where the monthly average attendance exceeds twenty or multiples of twenty-one more teacher maybe allowed provided that the excess is ten or more only. (b) In the case of schools which work in two shifts adopting the shift system the provisions of sub-rules (1), (2) and (3)(a) above shall not apply. The number of teachers for whom grants should be assessed should be fixed by the Deputy Inspector who shall fix the number with reference to the average strength and attendance as shown in the monthly returns of the school. This shall be done in the first week of January and July of each year with reference to the returns for the preceding six months, and the number so fixed shall be communicated to the managers. Appointment of additional teachers over this number, if necessary should be made only with the approval of the Deputy Inspector and reductions in the staff as fixed by the Inspecting Officers within ten days of such changes. While one teacher may be allowed for every 30 pupils in attendance, the Inspecting Officer may fix the number of teachers to be recorded. An appeal shall lie to the District Educational Officer against the orders of the Deputy Inspector in the matter. The number of teacher fixed by the Deputy Inspector shall be in.whole numbers only. (4) If the number of teachers employed in a school is greater than the number of standards or sections in the school or than the number for whom grant may be calculated under sub-rule (2), the teacher or teachers most junior shall be excluded from the calculation of the grant in whole or in part. (5) Teachers who have a continuous service of not less than 12 months in one or more schools are eligible for leave of 15 days per year, proportionate leave being allowed for service for fraction of a year in excess of the 12 months. The accumulation of such leave shall not exceed 45 days. Teachers granted such leave are eligible for assessment of grant in addition to the grant admissible under sub-rule (3) and (4) above and the leave sanctioned at a time shall not exceed the leave at credit. Such teacher should be paid full pay for the leave period. In the case of a teacher who is paid at a rate higher than the scale grant, the management shall have the option to pay him while on leave, leave salary based either on the scale of grant or on the higher rate at which he is paid while on duty. In additional to the leave referred to above married women teachers are eligible also for maternity leave up to a period of two months with full grants both for the teacher on such leave and for the substitute employed if any. The manager may grant maternity leave with full grant to married women teachers for a period which may extend up to two months. Non-permanent teachers should take for maternity purposes the ordinary leave for which they may be eligible. If, however, a non-permanent woman teacher is not eligible for any leave with full grant or if the leave to her credit is less than two months, maternity leave may be granted for a period not exceeding two months or for the period that fails short of two months as the case may be. Provided that in the case of married women teachers who are appointed temporarily when they are in an advanced stage of pregnancy, if they enter upon maternity leave before they put in a service of two months in the school; and also in the case of women teachers who are appointed temporarily for a period of one month or less before vacation and who apply for maternity leave after working for one or two days after the reopening of the school, maternity leave shall not be granted and the period of absence shall be treated as leave without grant. Permanent married women teachers employed in aided elementary schools may be granted maternity leave in cases of abortion also for a period which may extend to six weeks. A non-permanent married woman teacher employed in aided elementary school should take in such cases ordinary leave for which she may be eligible under paragraph I of this rule. If, however, she had been in service for not less than one year before the commencement of the leave and if she is not eligible for any leave under paragraph I of the rule, or if the leave to her credit is less than six weeks, maternity leave may be granted for a period not exceeding six weeks or for the period that fails short of six weeks as the case may be. Unless an abortion takes place in a Government hospital or Local fund or in Municipal hospital or in a recognised Nursing Home and the respective medical officers-in-charge of the institution certifies that the abortion took place after twelve weeks of pregnancy, the leave should not be granted. Where there are no hospital facilities women teachers should appear before a registered medical practitioner when the signs of abortion still exist or go to him for antenatal examination after twelve weeks of pregnancy so that the registered medical practitioner may be in a position to issue necessary certificates. An appeal shall be to the Divisional Inspector of schools against the order of the District Educational Officer. (7) (a) The grant calculated as above shall be called the assessed grant. (b) The assessed grant shall be reduced proportionately for the shortage in the number of working days in the calendar year, if any, provided the shortage exceeds 10 per cent and has not been condoned by the competent authority. If it is proved to the satisfaction of the District Education Officer that the teachers except when they happen to be teacher-managers, were not responsible for the shortage, this reduction shall be made in the maintenance grant. The grant so calculated shall be the final assessed teaching grant. Provided that this sub-rule shall not apply in the case of teachers employed purely on a temporary basis for a period not exceeding one month. In such cases the certificate of general educational qualification of the teacher must have been verified by the Inspecting Officer and found to conform to requirement. 6. Assigned teaching grant. - (a) The District Educational Officer shall sanction a school the full assessed teaching grant as the final assigned teaching grant. He may, however, impose a fine on a teacher not exceeding 10 per cent of his pay. (iv) for admission of pupils below five years of age except in the case of Pre-Basic section attached to Basic Schools where children between the age of 2-1/2 years to 5 years can be admitted and for admission made during periods other than those prescribed by rule 22(a) of the Rules for Recognition without the sanction of the Deputy Inspector. (b) If the defects include those of the kind referred to in the sub-clause (iii) above and are so serious as to justify in the opinion of the Inspecting Officer the withdrawal of recognition and aid, a separate and detailed report shall accompany the Inspection Report of the school clearly explaining the defects and the grounds on which the withdrawal of recognition and aid is proposed. Recommendations of the Inspecting Officers as regard the total withdrawal of aid shall be limited to exceptional cases. (c) Intimation shall be given in writing to the manager, at the time of inspection or soon after the inspecting officers' intention to recommend a reduction of the grant together with his reasons. (ix) on account of the shortage in the number of working days in the calendar year, if any, which has not been condoned by the competent authority. (ii) schools which have less than five standards, except in the case of schools with Standards I and II or III and approved by the Divisional Inspector as feeder schools. (iii) Grant under sub-rule (1) above may be sanctioned for schools newly started and which are developing year by year by opening higher standard. 8. Determination of grants. - In addition to any other visit which may be paid by an Inspecting Officer to an aided school, there shall be an annual inspection. The week fixed for the annual inspection shall be communicated to the Manager at least seven days before hand. Before the 15th of each month, inspection reports on schools inspected during the previous month by the Deputy Inspectors, with their recommerdations regarding grant-in-aid to the schools, shall be sent to the District Educational Officers who will review the reports and fix grants. The Divisional Inspector, may wherever necessary refix the grant fixed by the District Educational Officer. The grant fixed by the District Educational Officer with reference to rules 6 and 7 above shall be called the assigned teaching grant and maintenance grant respectively. 10. In all cases the payment of grants will be subject to the funds available for the purpose. 11. With reference to rule 8 above grants shall be assigned to all schools admitted to aid. Grants shall not be assigned provisionally or withheld or postponed for payment from funds to be provided in subsequent years. Grants shall be finally assigned to all schools admitted to aid before the payment of grant is sanctioned to individual schools. Provided that no arrears grant shall be sanctioned if it is not claimed within a period of three years after the close of the year to which it appertains unless it can be proved to the satisfaction of departmental officers, that the claims could not be made earlier owing to unavoidable circumstances, viz., proceedings in a court of law and time taken to decide heirship or guardianship. 13. The final assigned teaching grant received by a school shall be paid to the teachers employed in it by way of salary, each teacher being paid as per the assignment. 14. A sanctioned grant may, for reasons to be recorded in writing, be withdrawn by the District Educational Officer at any time before payment and shall not be deemed to be a debt enforceable by suit or by any other legal process. Every such order of withdrawal shall be reported to the Divisional Inspector of Schools. 17. (1) Applications from new schools for admission to aid in any official year shall be made to the District Educational Officer through the deputy Inspector of schools. The applications shall reach the Deputy Inspector of schools before the 1st of September. (2) Applications for aid from schools which have been granted temporary recognition for a specified period shall be made to the Inspecting Officers concerned not later than three months before the expiry of such period. (3) The application for aid shall be in the form prescribed in Appendix-8. 18. The District Educational Officer may entertain an application for aid from any school, if the school is otherwise eligible for aid, if the application is preferred within three months after the date specified in rule 17. In all cases where the period to be condoned exceeds three months, the approval of the Divisional Inspector of Schools shall be obtained. 19. The District Educational Officers shall scrutinise the application for aid and shall determine what schools shall be admitted to aid. In determining this, they shall take into account the number, the character and the financial condition of the schools, the educational needs of the locality and funds available. 21. Tabulation of schools admitted to aid. - The District Educational Officer shall draw up a consolidated list in the prescribed form (Appendix I) of all recognised elementary schools indicating those admitted to aid. A list of schools not admitted to aid shall also be prepared at the same time, the reasons for rejection being briefly indicated in each case. Publication of list. - A consolidated list of all recognised elementary schools indicating those admitted to aid shall be published in the prescribed form Appendix 1 for each district, and shall be issued to the President of District Boards, Chairman of Municipal Councils, Treasury and Inspecting Officers and Health Inspectors. 22. Payment of grants. - The teaching grant including dearness allowance payable to aided elementary schools will be paid monthly according to the procedure and programme mentioned hereunder. The maintenance grant due to the school will be paid annually along with the final payment of teaching grant in February of each year. Immediately after the close of a month, managements shall submit the monthly returns due for the month to the Deputy Inspector of Schools so as to reach him not later than the 3rd of the succeeding month. The Deputy Inspector of Schools after scrutiny of the returns shall submit the statement of grants recommendations to the District Educational Officer so as to reach him on or before the 7th of the month. The District Educational Officer after the scrutiny of the statement shall sanction the grants by the 15th of that month and arrange for payment. The Deputy inspector of Schools may, for special and satisfactory reasons, submit supplemental recommendations list in respect of monthly return received after due date. The District Educational Officer shall, on receipt of the supplemental recommendation list from the Deputy Inspector of schools, also sanction the grants after the 15th and arrange for payment immediately. The grant bill shall be prepared by the District Educational Officers in the prescribed form (Appendix 9) for each school or for each set of schools under the same management in the same local area and having the same manager and it shall show separately the teacher grant, dearness allowance and maintenance grant. The payment of the monthly grants shall be made by bills on treasuries and sub-treasuries to schools in the Chennai City and in the District and taluk headquarters irrespective of the amount and to schools receiving a grant of Rs. 200 or above per mensum irrespective of their location. Payment to other schools shall be made by bills or money orders according to the choice of the managements of the schools to be expressed in writing. The choice once exercised shall not ordinarily be changed. Postal charges for sending the bills and the money order commission shall be borne by the respective managements (who may pass on the expenditure to the respective teachers insofar as it relates to the grants due to teachers and bear it themselves insofar as it relates to the grant due to the managements) and shall therefore be deducted from the grants due to the schools. No payment, checking up teaching grant statements for final payment. (a) Second week-Payment of final instalment of grant along with maintenance grant. (b) Third week-Grant for January. Grant for November provisionally made up to 75 per cent of the grant for October. 23. The District Educational Officer may pay direct to teacher, teaching grant up to the maximum of the final assigned grant as prescribed in rule 13 after deducting any salary which the teacher may have received from the manger. (f) which has not been inspected in the calendar year for which grant is payable except in the case of a school where for administrative reasons, the Government have waived the inspection of the school during the calendar year. Provided that if he is qualified to vote at such an election he may exercise his right to vote, but shall, as far as possible avoid giving any indication of the manner in which he proposes to exercise or has exercised that right. The manager of a school may be required by the Director of Public Instruction to dispense with the services of any member of the teaching staff or other establishment employed in the school, who contravenes the provisions of this rule. Failure on the part of the manager to comply with such requisition shall render his school liable to forfeiture of Government grant. 26. Returns to be furnished by the managers of school. - A monthly return in the form prescribed in Appendix 12 shall be furnished by the manager of every elementary school to the Deputy Inspector of Schools so as to reach him not later than the 3rd day of the month immediately succeeding that to which the return relates. (1) Purchasing, erecting, enlarging, or improving school houses or buildings or student's hostels, including residential quarters for the warden or other staff and for sinking wells. (2) Executing extensive alterations to buildings. 2. Conditions of grant. - (1) In the case of new buildings, extensions or alterations, the Director must have been convinced of their necessity and have approved their character. Works commenced before obtaining the special permission of the Director will not be eligible for grant. (i) In the case of purchases of land or building, the Director must either have been consulted before the purchase was made or be convinced that land previously purchased is to be newly devoted to an educational purpose. (ii) Grants will not generally be given for a school building that fail to meet the requirements specified in Appendix 14. Dormitories must be large enough to allow, if for a single pupil, 80 superficial feet and 900 cubic feet, if for more than one pupil, a proportionately diminishing space down to 30 superficial feet and 400 cubic feet per head for ten or more pupils. A space of at least 8 superficial feet and 80 cubic feet per head should be provided in every room used as a dining room or for any other dwelling purpose, other than sleeping. 3. Building grant procedure. - (i) Applications in the prescribed form (Appendix 15) shall be submitted through the District Educational Officer accompanied by such outline plans as will enable the Director to judge, of the suitability of the proposal from an.educational point of view. (ii) If the Director considers the scheme in general as essential and suitable the Correspondent shall then submit to him in duplicate, detailed plans, specifications and estimates (which may include Architect's and Engineer's fees) prepared by a recognized professional Architect, a member or associate member of the Institute of Civil Engineers, a Gazetted Officer of the Public Works Department, present or retired or a present or retired District Board Engineer, who will be responsible for the structural stability of the building. No building operations shall commence until after the issue of favourable orders on the suitability of the design and the reasonableness of the estimate from a technical point of view. If after completion of the work the Correspondent applies for a grant, he will be required to furnish a certificate in the prescribed form (Appendix 16) signed by the Architect or Engineer in charge of the work to the effect that the building or buildings have been completed generally in accordance with the plans and specifications which were submitted and approved by the Director and another certificate signed by the Correspondent himself, specifying the total amount actually spent on the building. (iii) Where it is proved that private qualified professional advise is not available the management shall, prior to the commencement of work thereon, give fifteen days' notice in writing to the Executive Engineer in charge of the division wherein it is proposed to construct the building. During the progress of work, access thereto and every reasonable opportunity to inspect and examine materials and take measurements shall be afforded by the management to the officers of the Public Works Department. A fee of one per cent of the total estimate shall be levied where actual supervision of construction by the Public Works Department is required. In respect of cases where a grant is applied for and proposed to be considered, the Director of Public Instructions will call for a valuation of the work done from the local Engineer, Public Works Department. 4. Priority list of approved work. - The Director will maintain a list of works approved by him from a technical point of view. But the inclusion of a work in the list referred to implies no sort of liability on the part of Government legal or moral, for making a grant though managements will not be precluded thereby from applying for a grant after buildings are completed. Subject to the existence of budget provisions, the Director may sanction grants not exceeding Rs. 500 in each case. As regards cases where the grant payable exceed Rs. 500, the Director will in each year recommend for the consideration of Government such new schemes out of the list maintained by him as he considers deserving of grant and will authorize payment of grant under specific sanction of Government in each case out of the funds placed at his disposal for the purpose. 5. (i) Execution of mortgage. - Whenever a scheme is approved and Government or the Director of Public Instruction, as the case may be, sanctions a grant, the management shall be required to execute a deed of mortgage of property concerned or a deed of acceptance in respect of the grant payable in any one of the appropriate forms of deed prescribed in Appendices 17,18,19, 20 and 21. Forms in Appendices 17,18, and 19 shall be used when the grant exceeds Rs. 1,000. Form 20 when the grant exceed Rs. 500, but does not exceed Rs. 1,000; and Form 21 when the grant does not exceed Rs. 500. The Director may, however, grant exemption from the. execution of the deed in cases where the grant does not exceed Rs. 10,000 if he considers that the execution of the deed is unnecessary. (ii) Title examination. - The management except in cases where exemption from execution of mortgage or a deed of acceptance has been given, shall be required to prove to the entire satisfaction of the Government Pleader its title to the property in question and its right to mortgage the same to Government in respect of the grant by producing all the connected title deeds and complying with his other requisition in that connection. No payment of grant shall be made before the Government Pleader declares the title of the management to the property to be in order. (ii) The Government Pleader will be permitted to charge for the examination of title and settlement of mortgages in connection with building grants sanctioned for educational institution fees not exceeding 1 per cent of the grant sanctions subject, however, to a minimum of Rs. 20 and a maximum of Rs. 250 in each case. One half of the Government Pleader's fees and registration fees that will be incurred in connection with the execution of the deed of agreement will be reimbursed to the management in the shape of a supplementary grant from State Funds. (iii) Grants sanctioned for any of the purposes mentioned in rule 1(1) and (2) except the purchase of building shall be drawn on bills prepared in the form printed as Appendix 22. Grants sanctioned for the purchase of buildings or for the purposes mentioned in rule 1(3) shall be drawn on bills prepared in the prescribed form printed as Appendix 23. 6. (a) Amount of grant. - The grant payable shall not exceed in the case of buildings erected, one half of the total cost of the work shown in the management's estimates as approved by the Director and modified by the Public Works Department or certified in the valuation statement of the Executive Engineer, whichever is less and in the case of building or lands acquired one half of the Collector's estimate of the value of the same or of the actual cost of acquisition or purchase, whichever is less. The amount of grant so payable will be further limited to Rs. 4,000 in the case of lower elementary schools and Rs. 7,000 in the case of higher elementary schools if one half of the estimated cost or value referred to above exceed these limits. However, where a management receives a private benefaction amounting to not more than one half of the cost of construction or purchase of a building or an acquisition of land for an educational institution, it shall be entitled to take full credit for such benefaction in arriving at its share of the cost of the construction of the building or acquisition of land and where the private benefaction is in excess of the management's share of the cost, viz., one half, such excess shall be taken in deduction of the State Government's half share of the cost. (1) A certificate from qualified engineer in charge that the construction is proceeding on sound lines in accordance with the approved plans, specifying the stage of work and his estimated value of the work done. (2) A certificate signed by the correspondent himself specifying the actual amount spent on the construction and that the grant claimed is not more than one half of the actual expenditure incurred towards the construction. In cases where private benefaction have also been received, the amount should be stated and if the amount till then received is in excess of the management's share of the cost of the work executed till then, such excess will be deducted from the amount of advance grant. Before making payment the Director will require the management to furnish the certificate referred to in rule (ii) of the valuation referred to in the rule 3(iii) as the case may be, showing the actual amount expended by them in completing the work, purchase or acquisition and if necessary he may call for the vouchers at any time in support of the expenditure incurred. He will also require the management to furnish a certificate specifying the total amount of private benefactions received in respect of the work. 7. Claims of the Government. - If a building for the acquisition, construction, extension or alteration of which a grant has been drawn, or if land for the acquisition of which a grant has been drawn has prior to the expiration of forty years when the grant exceeds Rs. 1,000 or twenty years when the grant is Rs. 1,000 or less, been diverted to purposes other than education purposes approved by the Director of Public Instruction the manger shall refund such portion of the grant as may be determined by the Director. The period of forty or twenty years, as the case may be shall be held to commence as from the date of payment of the grant. If the manager fails to make such refund the Director may recover the amount by such means as he may think fit. 8. Grant for sinking wells. - Application for grants for sinking wells shall be made through the Inspecting Officers to the Director of Public Instruction. The managements should construct only simple type of wells, just sufficient to meet the requirements of the schools. Grants for any one well scheme shall be limited to Rs. 500. The Director shall dispose of applications for grants exceeding Rs. 300 and submit to the Government applications for grants exceeding Rs. 300. The conditions prescribed in this chapter shall, so far as may be, apply to these grants. 1. Applications for aid. - Applications for grants under this chapter shall be in the prescribed form (Appendix 24). They shall be submitted through the Deputy Inspector of Schools to the District Educational Officer not later than 1st May and shall be accompanied by details showing the number, description and price of each article which it is proposed to provide. 2. Objects and proportion of aids. - (i) Grants not exceeding one half of the total cost may be given for furniture, and for apparatus, chemical, maps, diagrams and models for books for school libraries, in connection with the expenditure on gymnasia and games up to a limit not exceeding the amount of fees for games collected during the preceding school year from the staff and pupils; for the plant, materials and tools needed in industrial and technical sections of elementary schools; for the purchase of gardens of horticultural or agricultural tools and for needle work or other art and industrial exhibitions. (ii) Grants shall not be given to meet the cost of seats or desks of a pattern which has not been approved by the District Educational Officer. In special cases grants may be given for books and slates for the use of pupils on condition that the books and slates remain the property of the school, are used by the pupils during school-hours only and are not removed from the premises. (iii) Grants shall not be given for articles regarding which the District Educational Officer has not been consulted and for which aid has not been promised previously to purchase or manufacture. (iv) However, where management receives private benefaction amounting to not more than one half of the cost of equipment it shall be entitled to take full credit for such benefaction in arriving at its share of the cost of the equipment and where the private benefaction is in excess of the management's share of the cost, viz., one half, such excess shall be taken in deduction of the State Government's share of the cost. 3. Payment of grant. - The grant shall be paid only on submission before the date specified in the order sanctioning the grant of vouchers duly receipted. It shall be drawn on a bill prepared in the prescribed form (Appendix 25). In case where a management received a private benefaction referred to in paragraph (iv) of rule 2 above, the management should furnish a certificate specifying the total amount of private benefaction received. 4. Claims of the Government. - If an institution which has received aid under this chapter is closed within five years from the date on which a grant under Chapter 3 is drawn, the Director of Public Instruction, may at his discretion, decide what portion of the giant given should be repaid to Government. In cases where craft equipment are supplied to Basic Schools at State cost, the management shall give a declaration in the prescribed form (Appendix 27). 5. Sanctioning authority. - Subject to the existence of budget provision, grants exceeding Rs. 250 but not exceeding Rs. 500 may be sanctioned by the Divisional Inspector and grant not exceeding Rs. 250 may be sanctioned by District Educational Officer. Grants exceeding Rs. 500 may be sanctioned by the Director of Public Instruction. Grant may be promised towards the erection or enlargement of village School-houses or to provide living quarters attached to the school for a teacher, provided the villagers undertake to furnish sufficient materials and labour to complete the building. Grant may also be promised for the equipment of such school-houses. A village school which has received aid under this chapter shall remain the property of the village and will be immediate charge of the village munsif. Save in exceptional cases, grant sanctioned under this chapter shall not exceed Rs. 25 and for equipment Rs. 100. The latter amount shall be spent upon school furniture and equipment only. Subject to the existence of budget provisions, grant under this Chapter may be sanctioned by the Director of Public Instruction. 1. The rules relating to the recognition and aid to elementary schools laid down in Chapters I and II shall be applicable to Adult Literacy Schools also excepting those or any of the said rules that are repugnant or contradictory to the rules mentioned hereunder. 2. Admission. - Adults between the ages of 13 and 40 may be admitted into these schools. 3. Course. - The course shall consist of three years' duration. The first year's instruction will aim at making the adults literate and enable them to read specially prepared books. The next two years will be towards the achievement of a standard that will enable the adults to read and understand a newspaper. The prescribed syllabus shall be followed. The methods that will be adopted will be the ones approved by the department and all aids to quick literacy like slides, pictures, charts and reading sheets shall be used. 4. Staff. - Teachers employed in Adult Literacy Schools may be part-time teachers. Those employed under local bodies may, with the permission of the executive authority of the local body concerned, work in an Adult Literacy School and they shall be eligible to receive, the grants as per the scales prescribed below. Teachers in other day-schools and those who are employed in other professions and trades will also be eligible to be teachers in Adult Literacy Schools provided they possess the qualifications mentioned in rule 5. (b) Adult Education Teacher's Certificate granted after a successful period of training at one of the recognised centres. 6. Building and equipment. - Any available building in the place shall be utilised for the schools. No separate building or furniture of any kind need be provided. In course of time, a small library may be built up in every school. 7. Syllabus. - A syllabus specially prepared and approved for the purpose should be followed in these schools. A special set of books prepared for use by adult should be followed in later stages. 8. Basis of grant. - In an Adult Literacy Schools during the first year, it need have only one teacher for 20 pupils. In subsequent years, when pupils are taken to a second year, a teacher shall be allowed for each class, but no school shall have more than three teachers as the scheme is intended to cover only a period of three years and at no time should any schools have more than three classes or sections. A uniform rate of Rs.12 per month and an additional flat rate of Rs.4 per month to cover lighting and other incidental charges. (2) Others i.e. those that come under the note to rule-5. A uniform rate of Rs.8 per month and an additional flat rate of Rs.4 per month to cover lighting and other incidental charges. 11. In view of the above rulings Adult Night Schools that were already recognised will cease to be recognised ones unless they conform to the rules mentioned above whether they be in receipt of grants or not. 12. In the case of Adult Literacy Schools run by local bodies, the teachers may be renumbered at the rates prescribed in rule 9 and the expenditure may be met from the Elementary Education fund under salary and allowances. Number and date of the District Educational Officer's order recognized the schools. Grant paid in previous year. Date fixed for annual inspection . Date and number of previous proceedings or orders in regard to the recognition. Society, Association, or person owning the school. Standards on behalf of which recognition is now sought. On behalf of the management of the school, I hereby declare that the school fulfils all the conditions specified for elementary school in the rules framed by Government, and promise that it shall continue to fulfil those conditions so long as it remains recognized and that such returns as may be required by the Department of Public Instruction will be duly furnished. The register of attendance should be kept in books of prescribed printed form, having the pages numbered. Great care should be taken to keep it perfectly correct. No entries are to be made in pencil to be inked over after wards. There should be no blank or erasures. If any error has been made it should be corrected by a foot-note and initialled by the person making the correction. In every case the register produced should be the original register and not a fair copy. The attendance should be filled up daily. It should never be entered two or three days at a time. Morning attendance should be marked thus/afternoon attendance should be marked full attendance X. There should be no dots. Pupils sick may be marked absent with leave I; absent without leave, a. (1) If a pupil is admitted into a class on the first school day of a month, his name should be entered in red ink. (2) If a pupil is admitted on any other date than the first school day of a month, say on the 4th a black ink line should run through the space for the first three days attendance. (3) A pupil re-admitted whether at the beginning or in the middle of the month, should have his name entered in black, but underlined with red ink. (4) If a pupil left school in the middle of a month, a black line should be drawn through the attendance spaces from the first day he left to the last school-day of the month. Date of birth of child. Marks of identification of child. Date of discharge of parent from the army. I certify that the above entries are correct and that entries (5) and (6) agree with entries in the parent's certificate. Average monthly income from (i) fees (ii) endowments and (iii) miscellaneous sources. On behalf of the management of the school, I hereby declare that the conditions of recognition and aid laid down in the rules framed by Government are being, and will continue to be fully observed, except in those rules from which the institution has been specially exempted by the District Educational Officer's Order No.or Directors Proceedings No. ....dated and that I am prepared to subject the institution together with its current endowment and trust accounts, its establishment, time-table and registers to inspection and to furnish such returns as may be required by the Department of Public Instruction. "37. Education-Primary-(k)-Direct Grants to Non-Government Primary Schools (a)-A. General-I. Ordinary Areas-(i) Excluding Post-war Reconstruction (k) - A.I. (i) I.A.I (L) Teaching voted". "37. Education-Primary-(k) Direct Grants to Non-Government Primary Schools-A. Generate. Ordinary Areas-(ii) Post war Reconstruction-(k) A.I. (ii) I. Teaching voted". Bill for teaching grants for 20.20.... on behalf of Elementary Schools in the Taluk/Municipality, district, under the management of district. Recoveries of over payments under XXVI-Education-E General-C. Recoveries of over payments. Recoveries on account of Postage under 37, P. Education-General Inspection. B. Non-European Men's Branch-I. Ordinary areas Contingencies-Voted-Service postage and telegrams. Net amount to be paid............(in words) rupees. Scale of pay according to the terms of the service register. Certified that a proper acquittance has been taken in respect of each amount paid in roll from the person entitled to receive it. Certified that a proper acquittance has been taken in respect of each amount paid in roll from the person entitled. Total assessment for the month. Number of underaged pupils on rolls. reference to the average attention. 6. Holidays for the next month. 7. Details of change in accommodation, school hours, or holidays, if any during the month. (i) A site should not be selected if its natural position is in a hollow or in the neighbourhood of high trees or houses which prevent the free circulation of air and the access of sunlight to the school buildings. Shady trees are, however, of value in the playground, provided that they do not unduly reduce the space available for play and are not planted so close to the school buildings as to obstruct the entry of light into the classrooms or in course of time, to cause damage to the structures. (ii) Mud soil should be avoided and, as far as possible, all soils which are specially retentive of moisture. (iii) Sufficiency of space is important, and in this connection, the possibility of future extension and the necessity of giving the subsequent class-rooms the proper orientation should be borne in mind. (iv) Canals and tanks in the vicinity are a disadvantage. (v) The presence of rank vegetation, more especially prickly-pear, is objectionable. (vi) The neighbourhood of dusty and noisy roads and of shops or factories should, as far as possible, be avoided. 3. This will differ for different parts of the State and will depend chiefly on the best way to secure circulation of air. Subject to this, the more buildings are lighted from the north the better. For elementary schools - 9-1/2 square feet per pupil. Rooms which are intended to be used for practical work, such as drawing rooms, workshops etc., should be carefully designed with a view to the nature of the work and number of students to be accommodated. 5. It is desirable that the floor should be made of a material which will admit of their being washed with water. Stone flooring or something better must be aimed at-in rooms where desks or benches can be provided. Where the pupils have to sit on the floor, stone floors need not be insisted on if objected to. At the same time, it must be recognised that from the hygienic point of view, they are to be preferred and the objection on the score of their coldness can be met by providing boards or mats. But where this is done, the greatest care must be taken to ensure that the mats are kept scrupulously clean. 6. The general principles which should govern the construction of desks are set forth in Annexure (i). Where dual desks may be arranged most suitably as shown in diagram in Annexure (ii). 7. Forms without backs and desks are objectionable type, designs for desks are issued by the department. 8. Pupils should be seated in rows with the main light falling from the left side; they should never face the light. The same remark applies to teachers. 11. Window sills should not be more than 4 feet from the ground in rooms in which the scholars are seated at desks. When pupils sit on the floor, the sills should come to within 2-1/2 feet or 3 feet of the floor level. Windows for subsidiary lighting may have their sills more than 4 feet from the floor. 12. The window area should not be less than one-fifth of the floor area and, wherever possible, the principle lighting should be from the north. 13. Class-rooms should not have to be used as passages from one part of the building to another. They should consequently not open into one another but into passages or verandahs. No class-rooms should have more than two doors and in most cases one is preferable. The door or doors should be at the teacher's end of the room. 14. The minimum height of the room in elementary school should be 10 feet to the beam when the room has an open sloping roof and 12 feet to the under side of the joist where the room has a terraced ceiling. 16. It is important that no school or class-room should be more than 24 feet in width, or otherwise, the rows of pupils will be too long to be properly controlled by the teacher. The length of a room must depend on the number of classes to be held in it, in the case of a school divided into a number of class-rooms, the dimensions of any room should not exceed 24 feet, that is, an approximate square. If it is admitted that a square is the best area for teaching purposes, the length of a class room in a one-roomed school should approximately closely to some multiple of the width. Ample wall blackboard space should be provided especially on the wall at the teacher's end of the room which should be unbroken by doors, windows or cupboards. Cupboards recesses in other walls should be provided, also recesses with open shelving. Rails under the cornice for having maps, pictures and diagrams are essential. The smallest class-room for 40 boys in dual desks should be 21 feet wide and 23 feet long. The arrangement of such room is shown in the enclosed diagram C.A. No. 306 of 1917 [Annexure (ii)]. To accommodate similarly desks of large dimensions those of the room must be proportionately increased. 18. Latrines should not be placed nearer than 30 feet to any school building They should be so situated that the prevailing wind will not blow from them in a direction of the school. 19. The type of designs of the sanitary department should be constituted. 20. For elementary schools, separate urinals and latrines should be provided. Separate accommodation should in all schools, be provided for the teaching staff. 22. There should be in addition for boys urinals at the rate of 4 per cent or if separate urinals are not provided the number of latrine seats should be correspondingly increased. 1. The seat should not be so high as to prevent the child resting its feet upon the floor or on a footboard, and if the latter, the knees should not be elevated. 2. Assuming to child to be sitting upright in his seat and the arms to be hanging freely down the edge of the desk next, the body should be about an inch higher than the level of the elbows in the case of boys, and from 1.5 inches to 1.75 inches in the case of girls. (If the desk be higher than this, there is tendency for the boy to be twisted and for one shoulder to be raised above the other with the consequence risk of lateral curvature of the spine). 3. A line dropped from the edge of the desk ought to strike the edge of the seat or a point an inch or two within it. (This arrangement obliges the child to assume an upright position which is best for eyes and the spine). 5. A desk must not be flat. It should slightly incline towards the child. 6. The seat should not be flat, but saddle-shaped. Change of position will be desirable. 7. The desk must be easy of access yet compactly arranged. The angle of vision for the teachers should not be more than 450. 1. The sloping part of the top should be not less than 12 inches in width. 2. The inclination should be about 2 inches and the slope should be about 1 in 10. 3. The flat portion of the desk with groove should be from 3 inches to 3.5 inches in width. (a) Youngest Children - 20 inches to 25 inches to the middle of the slope. (b) Intermediate Children - 22 inches to 25 inches to the middle of the slope. (c) Oldest scholars-30 inches to 36 inches to the middle of the slope. The seat should be 16.5 inches high. 5. The back rail should not be more than 7 inches for younger children and not more than 10 inches for the older one. 6. The minimum space for each child should be 20 inches; 22 inches would be better. 7. The seats should be 8 inches wide. 1. Number and date of the proceedings or memorandum recognising the school under the Tamil Nadu Elementary Education Rules. 2. Brief history of institution from the date of its establishment to the date of application tracing its growth and development and furnishing among other things an accurate account of its financial condition. (3) Character and necessity for the proposed work in detail. (a) The relation of the proposed building or extension to the existing building ? (b) Any alteration in existing building necessitated by it ? 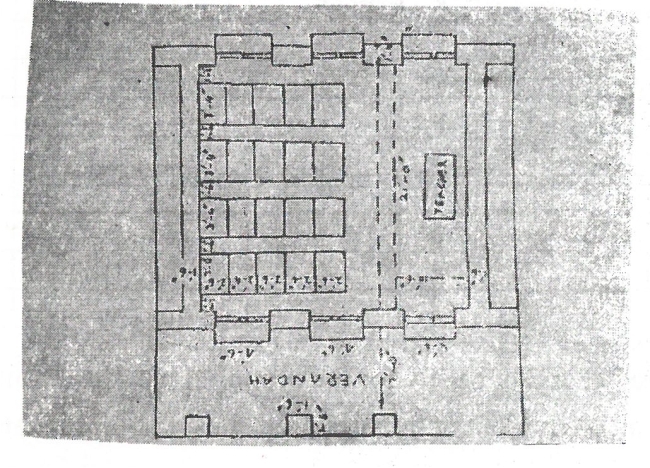 (c) The purpose to which the existing building are now put ? (d) The purpose to which they will be put when the new building or extension is completed ? 5. (a) Probable cost of the proposed work. (c) Whether the managing body has been registered under the Indian Companies Act of 1913 or any other Act, and if so, whether attested copies of the Memorandum of Association and the Articles of Association are submitted. (f) If the scheme relates to the construction of a hostel, declaration that the hostel will be managed according to rules approved by the Director of Public Instruction. (g) The annual expenditure incurred in the upkeep of the institution and how much of it is met from. 6. Inspecting Officer's remarks about accommodation from his inspection reports for the two previous years. 7. District Educational Officer's review of such remarks. Inspecting Officer's remarks and recommendations. Name or nature of work. That the deviations are not of such a nature as to effect the stability or the suitability of the buildings, and that, in my opinion, the deviations would have resulted in an excess cost/a saving of Rs ..........under/above the approved estimate. This Indenture made this. day of two thousand and........ between........(hereinafter called the mortgagor/mortgagors of the One Part and His Excellency the Governor of Tamil Nadu (herein after called the "Governor" which expression shall where the context admits include his successors in office and assigns) of the Other Part. In Witness Whereof the said..............and.............Director of Public Instruction for the State of Tamil Nadu acting on behalf of and by the order and direction of the Governor of Tamil Nadu have hereunto set their respective hands and seals the day and year first above written. Schedule to which the above written indenture refers. Whereas the mortgagor/mortgagors has/have purchased............, at the price of Rupees..........for the purposes of school and is/ are be and truly entitled to, and possessed, of the piece or parcel of land particularly described in the Schedule hereunder written with the buildings thereon and whereas the mortgagor/mortgagors/has/have in accordance with the provisions of the Elementary Education Rules of the Tamil Nadu Educational Department now in force in the State of Tamil Nadu applied to the Government of Tamil Nadu (hereinafter called "the Government") for grant-in-aid of the sum of Rupees.......being part of the said purchase money and has/have submitted to the Government the certificate referred to in rules 3, 5 and 6 of Chapter III of the said Rules to the value of the buildings and WHEREAS the Government have consented and agreed to make the said grant in the manner provided in Chapter III of the said Rules upon the mortgagor/mortgagors entering into the covenants on his/their part and giving the security hereinafter contained. Now The Indenture Witnesseth that the pursuance of the said agreement and in consideration of the payment of the sum of Rupees.................receipt, whereof the mortgagor/mortgagors doth/do hereby acknowledged he/they the mortgagor/mortgagors doth/do hereby for himself/themselves, their respective heirs, executors, administrators, legal representatives or assigns will from time to time, and at all times so long as the said buildings shall be used for the purpose of the said school conduct and manage such school or cause such school to be conducted and managed by the person for the time being in charge of same in accordance with the rules and regulations for the time being in force in the Tamil Nadu Educational Department so far as the same respectively as applicable to the said school AND will not prior to the lapse of years from the date hereof divert or allow to be diverted the said building to other than educational purposes approved by the Government and will during such period keep such buildings in good and substantial order and repair so that the same may be always efficient for use for the purpose of the said school and will in the event of the said buildings prior to the lapse of such period ceasing to be used for educational purposes approved by the Government forthwith repay to the Government a sum which shall bear a like proportion to the amount hereby advanced as the unexpired number of years of the period of...............years limited herein bears to the total number of years so limited. Provided Always and it is hereby agreed and declared that at the expiration of the said period of........... years hereinbefore referred to, the Governor shall, in the event of the covenants hereinbefore contained, on the part of the mortgagor / mortgagor his / their heirs, executors, administrators, legal representatives or assigns having been in the meantime duly performed and observed reconvey and re-assign at his or their cost unto the mortgagor/mortgagors his/their heirs, executors, administrators, legal representatives or assign or as he or they may direct all and singular the piece or parcel of land hereditaments chattels, goods or other premises hereby expressed to be granted conveyed or assigned. In witness whereof the said............ and........... Director of Public Instruction for the State of Tamil Nadu acting on behalf of and by the order and direction of the Governor of Tamil Nadu hereunto set their respective hands and seals the day and year first above written. Now This Indenture Witnesseth that in pursuance of the said agreement and in consideration of the sum of Rupees.............. paid by the Government to the mortgagor/mortgagors the receipt whereof he/they the mortgagor/ mortgagors doth/do hereby acknowledged he/they the mortgagor doth/mortgagors do hereby for himself/themselves his/their respective heirs, executors, administrators, legal representatives and assigns covenant with the Governor that he/they the mortgagor/mortgagors or his/their heirs, executors, administrators, legal representatives or assigns will from time to time, and at all times so long as the said piece or parcel of land shall be used for the purpose of the said school, conduct and manage such school or cause such school to be conducted and managed by the person for the time being in charge of same in accordance with the rules and regulations for the time being in force, in the Tamil Nadu Educational Department so far as the same respectively are applicable to the said school and will not prior to lapse of......... years from the date hereof divert or allow to be diverted the said piece or parcel of land to other than educational purposes approved by the Government and will during such period keep such piece or parcel of land in good and substantial orders so that the same may be always efficient for use for the purpose of the said school and will in the event of the said piece or parcel of land prior to the lapse of such period ceasing to be used for educational purposes approved by the Government forthwith repay to the Government a sum which shall be a like proportion to the amount hereby advanced as the unexpired number of years of the period,........years limited herein bears to the total number of years so limited. Provided always and it is hereby agreed and declared that at the expiration of the said period.......... of years hereinbefore continued on the part of the mortgagor/mortgagors, his/their heirs, executors, administrators, legal representatives or assigns having been in the meantime duly performed and observed, reconvey and reassign a t his or their cost unto the mortgagor/mortgagors, his /their heirs, executors administrators, legal representatives or assigns or as he or they may direct all the singular the piece or parcel of land hereditaments, chattel, goods or other premises hereby expressed to be granted conveyed or assigned. In witness whereof the said.......... and.......... Director of Public Instruction for the State of Tamil Nadu acting on behalf of, and by the order and direction of the Governor of Tamil Nadu have hereunto set their respective hands and seals the day and year first above written. We..........whose names are entered in the margin and whose signatures appear at the foot hereof hereby accept the special grant of Rupees.......only sanctioned by Government through the Director of Public Instruction, Tamil Nadu, for the ......... school at........... in the district of .......... in the proceeding of the Director of Public Instruction, No..........dated the.......... and in consideration of such grant, we hereby jointly and severally and on behalf of our successors in office and the owners for the time being of the land and premises described in the Schedule hereto now/to be occupied by the said school agree that if the school is prior to the lapse of............ years from the date hereof........... abolished or the land or buildings thereon diverted to other than educational purposes approved by the Government, the Government shall be paid a sum which shall bear a like proportion to the amount hereby advanced as the unexpired number of years of the period of.............. year limited herein bears to the total number of years so limited. We ........... whose names are entered in the margin and whose signatures appear at the foot hereof hereby accept the special grant of Rupees......... only sanctioned by the Government through the Director of Public Instruction, Tamil Nadu for the........... school at........ in the district of.............in the proceedings of the Director of Public Instruction No.............. dated the and in consideration of such grant we hereby jointly and severally and on behalf of our successors..........in ...........office and the owners for the time being of the land and premises now/to be occupied by the said school agree that if the school is, prior to the lapse of........ years from the date hereof or the land or buildings thereon diverted to other than educational purposes approved by the Government, the Government shall be paid by the owner thereof for the time being a sum which shall bear a like proportion to the amount advanced as the unexpired number of years of the period of years limited herein bears to the total number of years so limited. On behalf of the management, I hereby certify that the work, for which the grant as herein claimed, has been completed according to the plan and estimate approved in the order approving the scheme and I do declare that I agree to abide by the conditions laid down in rule 7 of Chapter III of the Elementary Education Rules in the event of the building being, diverted to purposes other than those for which the grant was sanctioned. On behalf of the management/I declare that I agree to abide by the conditions prescribed by rule 7 of Chapter III of the Elementary Education Rules in the event of the land or building being diverted to purposes other than those for which the grant was sanctioned. Applications For Grants For Furniture. Books, Etc. On behalf of the management of the school, I hereby declare that the conditions of recognition and aid laid down in the rules framed by Government, are being, and will continue to be fully observed excepting those rules from which the institution has been specially exempted by the District Educational Officer's Order No......... or Directors Proceedings No..........dated........... and that I am prepared to subject the institutions, together with its current, endowment and trust accounts, its establishment, time-table and registers to inspection, and to furnish such return as may be required by the Department of Public Instruction and that I shall abide by the provisions of the rules framed by the Government in the event of the school being closed within five years from the date on which the grant has been drawn. On behalf of the management, I hereby certify that the work, for which the grant is herein claimed, has been executed in accordance with the approved estimate for the articles, the purchase of which has been sanctioned, have been purchased in accordance with the sanction and I do declare that, in the event of the institution concerned being closed, I agree to abide by the conditions imposed in the rules framed by the Government. (i) Name of the pupil. (ii) Standard, Class or Form in which he/she is reading. (iii) Standard, Class or Form and the School in which the pupil studied in the previous year. (iv) Whether the pupil has remained for more than a year in any standard; Class or Form previously and if so, full details of the Standard, Class or Form in which he/she remained for more than one-year should be specified. III. Whether the pupil belongs to the Backward class and, if so, give details. V. Whether there is any landed property in the name of the parent or parents or guardian if so, the village, taluk and district. (i) Annual income from landed or house property of the parent or parents or guardian. (ii) Annual income from any other source such as business, pension, endowed income, etc., to the parent or parents or guardian. VII. Total annual income (items II, Plus VI(i) Plus VI(ii). I do hereby declare that the facts mentioned above are correct and true to the best of my knowledge. Signature of Karnam or Village Munsif. I certify that the particulars furnished above are correct to the best of my knowledge. I hereby certify from personal knowledge, that the particulars furnished above are correct. 2. The existing forms may be utilized till the stock is exhausted. I ............. hereby acknowledge the receipt of the craft equipments............... supplied by the Government of Tamil Nadu to the.............School. As the manager (Executive Authority) of the school. I hereby undertake the responsibility to maintain the aforesaid. Government equipments in good condition and in safety. If for any reason any of the equipments mentioned above are considered by the Educational Departments to be in excess of the actual needs; I shall surrender such articles to the Education Department. In case the school is closed the entire equipment shall be returned.